Government worker pensions have been driving up Illinoisans’ tax bills for decades. As a result, Illinoisans now pay the nation’s highest combined local and state taxes, according to a March 14 report by WalletHub. Unfortunately, Illinoisans shouldn’t expect that burden to lessen any time soon. 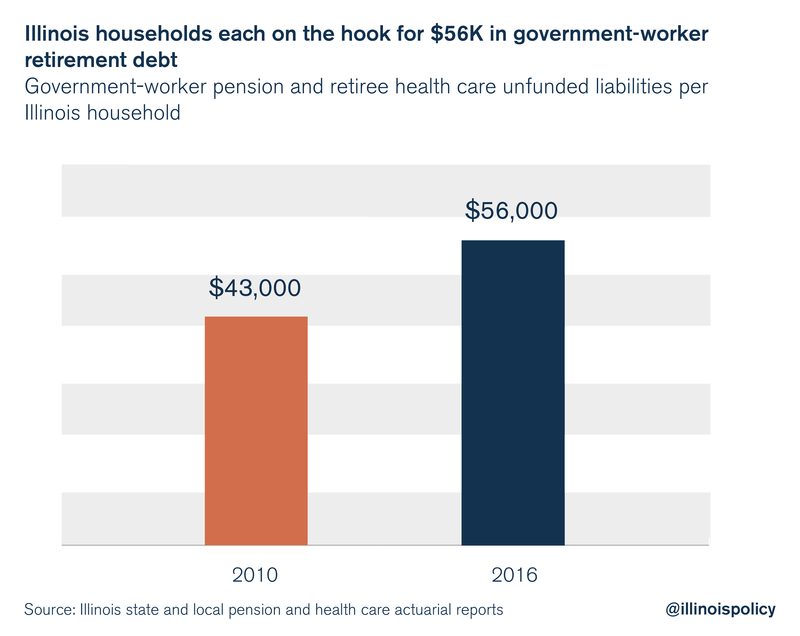 New government data show that Illinois’ unfunded government worker retirement debt has reached a record $267 billion, up from $203 billion in 2010. This means each Illinois household can expect to pay more than $56,000 in additional future taxes to pare down that debt. The debt includes nearly $190 billion in state and local pension shortfalls, as well as more than $56 billion in unfunded health insurance benefits for retired state workers. 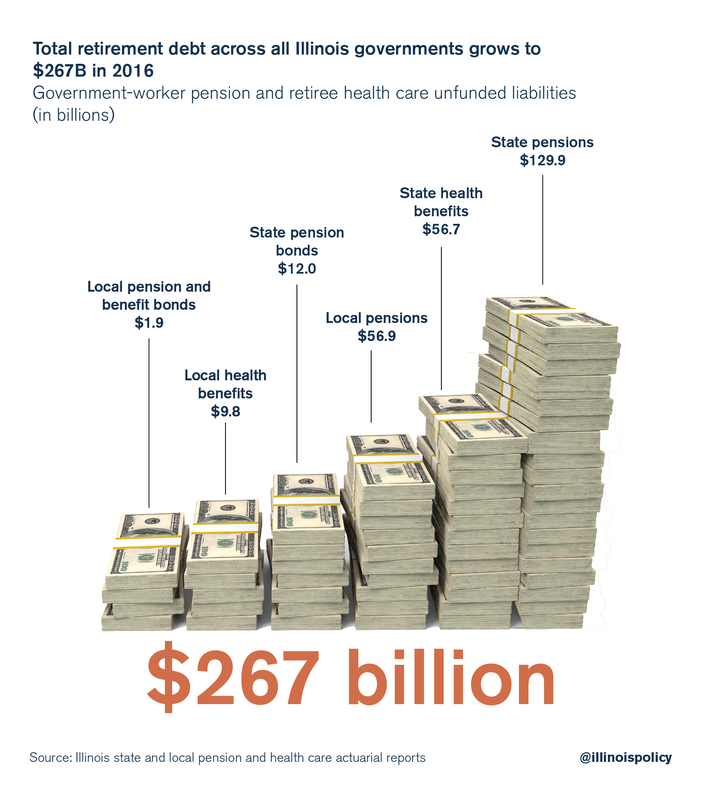 In 2012, the Illinois Policy Institute added up all the unfunded debt related to pensions and retiree health care costs for local and state government workers across Illinois. The total then – based largely on 2010 government reports – was $203 billion, the equivalent of more than $43,000 per household. In just six years, the total debt Illinois households are on the hook for has jumped to $56,000, or 31 percent. That’s a $13,000 increase for each household. In reality, many Illinois households don’t have the means to pay $56,000 in additional taxes. That means the burden will disproportionately fall on a smaller number of middle- and higher-income households. Many of those families, faced with an even heavier state and local debt burden, may not stick around to pay for it. And that means even fewer households to shoulder Illinois’ $267 billion in state and local retirement debt. Not surprisingly, the debt increases have come largely from growing pension costs. Illinois’ pension funds continue to worsen year after year. In 2016 alone, the state pension funds reported their total debt had increased by $19 billion, despite record stock market levels and taxpayer contributions. Illinois’ growing retirement debt is largely due to a jump in the state’s unfunded pension liabilities. The state’s pension debt grew by almost $50 billion – or more than 56 percent – between 2010 and 2016. That growth occurred despite the massive cash infusions of more than $40 billion state taxpayers made into the pension funds over that period. Illinoisans also owe over $56 billion in unfunded retiree health care liabilities – a number largely ignored by the media. The pension crisis is overwhelming at the local level, too. Local governments in Illinois owe nearly $69 billion in unfunded retirement debt. Chicagoans are the worst off. Not only are they on the hook for state debt, but many of their local and county governments have also amassed large amounts of debt. The city of Chicago alone owes nearly $23 billion in unfunded pension and health care debt, up nearly 60 percent compared with 2010. Chicago Public Schools’ pension debt, now at nearly $10 billion, has increased 78 percent. And Cook County’s pension debt has grown by 79 percent since 2010. Other local governments have seen their debts skyrocket as well. For example, the downstate firefighter pension funds’ collective debt has grown by nearly a third since 2010. There’s little that can be done immediately to reduce the amount of retirement debt Illinois has already incurred, barring bankruptcy, major concessions from the unions, or changes to the Illinois Constitution. The $267 billion will have to be paid down over time just like any other debt. 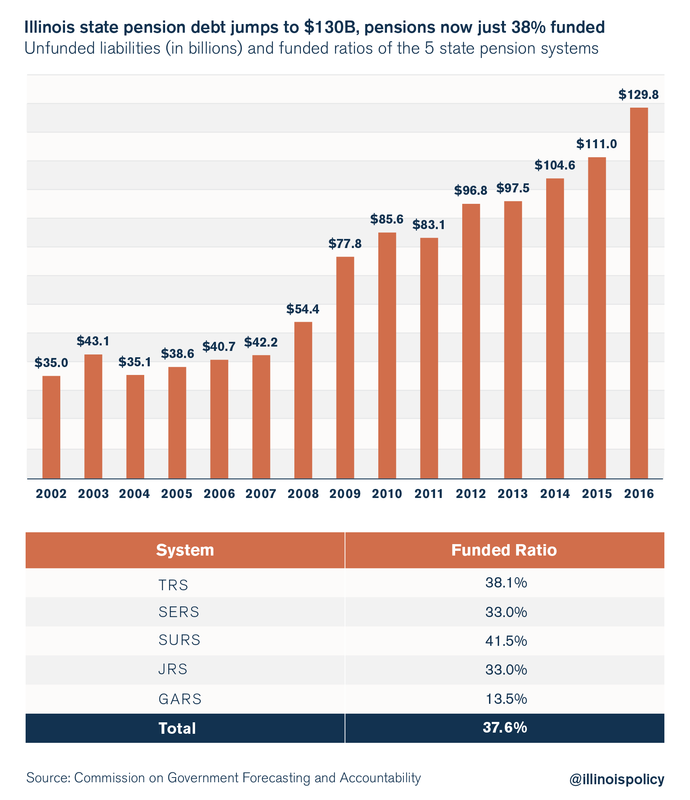 But as long as Illinois’ retirement systems continue to create new pension liabilities, Illinois will continue to create ever more pension debt. That’s not sustainable for taxpayers, government workers or the state itself. Moving away from pensions – and thereby stopping the growth in new pension debt – is essential. Illinois can do that by moving new workers into 401(k)-style plans and by giving existing workers the option to move to 401(k)s as well. At present, that’s the only constitutional way to begin an end to Illinois’ pension crisis. The state can transition from pensions to 401(k)-style plans as new workers are hired and older workers retire. As time passes, the threat of skyrocketing pension debts will decline. The good news is Illinois doesn’t have to look beyond its borders for a successful 401(k)-style plan to emulate. Since 1998, more than 20,000 state university workers have been able to opt into a 401(k)-style plan instead of the traditional pension plan. Illinois’ lawmakers can begin to solve the pension crisis by simply expanding that 401(k)-style plan to all state workers. Note: Due to the limitation of available data, the 2010 local government retiree health care debt was assumed to grow 4 percent annually through 2016. For 2010 data, see here.